COLD A/C in transport van, pick up every hotel, a max of 4 stops! Clean, professional grade equipment & Hawaiian Fish card included! 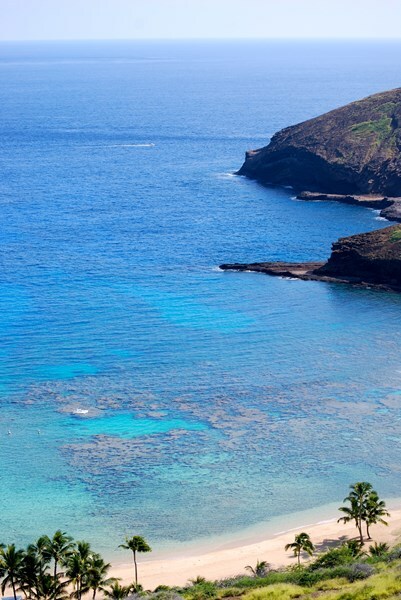 Hanauma Bay is the best place to snorkel in Oahu, let us take you there! It takes approximately 20 minutes to get from Waikiki to Hanauma Bay. Our company has 3, 8 passenger vehicles, which means that there's a maximum of 4 stops per vehicle, usually less! We start picking up at the Hilton Hawaiian Village side of Waikiki approximately 10 minutes prior to the scheduled pick up time. Our goal is to leave Waikiki by the time listed on the schedule-if everyone is on time and there is no traffic delay we are able to do this without any problem. The ride is direct to the bay without stops. They are outfitted either at the hotel or at Hanauma Bay. The drivers are very efficient with the equipment. Customers are given a verbal tour of points of interest, tips and instructions on adjustment of the equipment and snorkeling safety and information about the Bay (including tips on where to see the most fish) en route to Hanauma Bay. The tour allows for 2-2 1/2 hours swim time at the Bay. We add 1/2 hour to the total tour during summer to make up for time spent in line. Snorkel rental concession at the Bay is $20 for a set of snorkel equipment-We provide all that PLUS TRANSPORTATION (and so much more) for the same price. What a deal!!! Taking the bus takes 1 hour to get there from Waikiki, plus many times the bus is full by the time it gets to your stop and they just drive by without stopping. If you rent a car, you run the risk of getting there and having the parking lot be closed because it is full. There's no other place to park nearby and sometimes its closed for a long time. Hanauma Bay is one of the most visited natural attractions in the State of Hawaii. Located within an ancient volcano crater, its shallow, transparent and inviting waters brimming with marine life have been attracting millions of snorkeling and scuba diving enthusiasts for years. 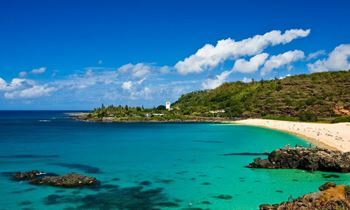 The bay is located on the east side of the island, within what is undoubtedly the most beautiful and scenic part of Oahu. A visit to Hanauma Bay is unforgettable. The shallow waters and abundance of fish have earned it the reputation of being the epitome of the Hawaiian experience. Tourists and locals alike frequent the beautiful and famous nature preserve year round. Being prepared with good sunblock, hydration and some familiarity with the Bay itself will help enhance your experience and avoid any potential downside. Please take the time to look through this page, get to know Hanauma before making the trip. If you do decide to add this extraordinary adventure to your itinerary, our friendly, knowledgeable staff can help you get the most out of your day by providing door to door service and clean, sanitary equipment at a great value. Come ride with us! Hanauma Bay is open every day except Tuesdays, from 6 am to 6 pm. The admission cost is $7.50 per person, no charge for children 12 and under. Please be advised that even if you buy a tour package, admission is never included in the package and must be paid separately at the park’s entrance. Snorkel gear can be rented at the beach level for $12. For those visitors that reach the bay on their own and need to rent mask, snorkel and fins, try to arrive as early as possible since long lines at the rental window are very common. There is no free parking anywhere near the bay and only very limited paid parking at the bay. When the parking lot fills up you will be turned away so plan to arrive early. If you park outside the Bay be careful where you leave your car or it may be ticketed or towed away by the time you return. Total cost per person (*): over $50.00 (car rental + parking + $20 snorkeling gear rental). Duration: about one hour (a little more during rush hour). Buses can be very full at return time so make sure that you allocate enough time in case you need to wait for a bus or two since they run every 30 to 60 minutes. 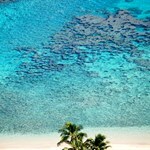 Total cost per person: $25.00 ($5 round trip + $20 snorkeling gear rental). Duration: 20-30 minutes (taxis are not allowed to wait for fares at the bay so you will need to call one in to pick you up). 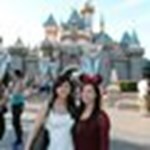 Total cost per person (*): $60.00 ($80 round trip. max 4 people+ $20 snorkeling gear rental). You will need time to watch a mandatory instructional video before entering the beach area and it takes a few minutes each way to travel from the visitor center to the beach. For those that choose not to negotiate the pathway from the visitor center to the water there is a trolley that will take you up and down the path for a small fee. The approximately 3 hour time frame allocated by the shuttle service should allow plenty of time for full enjoyment of the bay without over-exhaustion. There is little shade on the beach itself. For this reason it is advisable to avoid overstaying your time at the beach. Hanauma Bay is a Nature Preserve NOT a beach park, therefore, many beach park activities are prohibited such as ball playing, shell collecting and boating. 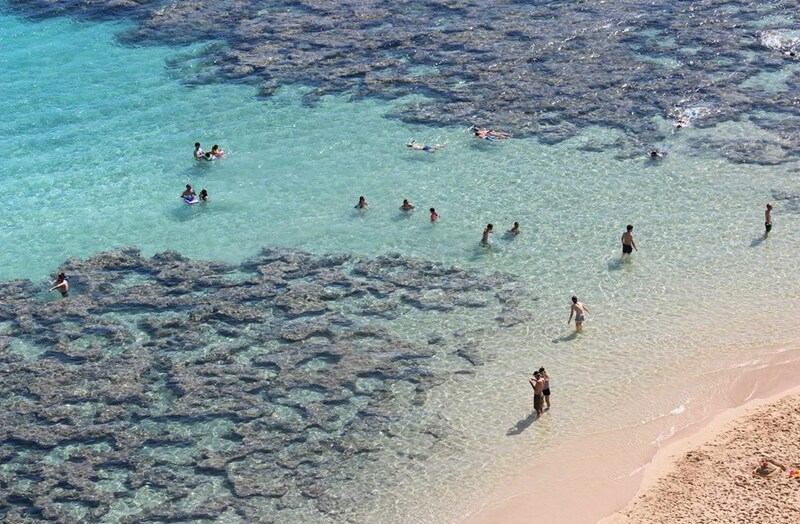 You will be advised, walking on the coral is also prohibited as the coral itself is part of the nature being preserved. You will need to bring your own towel, swimwear and the park entrance fee. Some optional items you may also like to have with you include: snacks and drinks (may be brought with you or purchased at the entrance to the park), extra sunscreen, a camera and extra spending money. There are small lockers (1 cubic foot) located on the beach level for a fee (manned-not coin operated) to hold your valuables, but we recommend that you travel light. You will want to spend most of your time in the water, so it is better not to have to haul many items up and down from the beach or have to worry about them while you are snorkeling. The bay is very accessible to swimmers of all skill levels. Much of the bay is shallow, but there are deeper areas and sudden drop-offs. It is possible to get slightly disoriented. For this reason, it is always better to snorkel in pairs. Children should never be left unsupervised. Do not step on the coral (there are no “rocks” in the water, everything that is not sand is coral). The coral and everything “attached” to it is either alive or has an organic component. If you accidentally scrape or cut yourself make sure that you wash and disinfect the injury thoroughly to prevent infection. Most of the fish in the bay are tame and used to human presence but do not touch, disturb or try to feed the marine life. 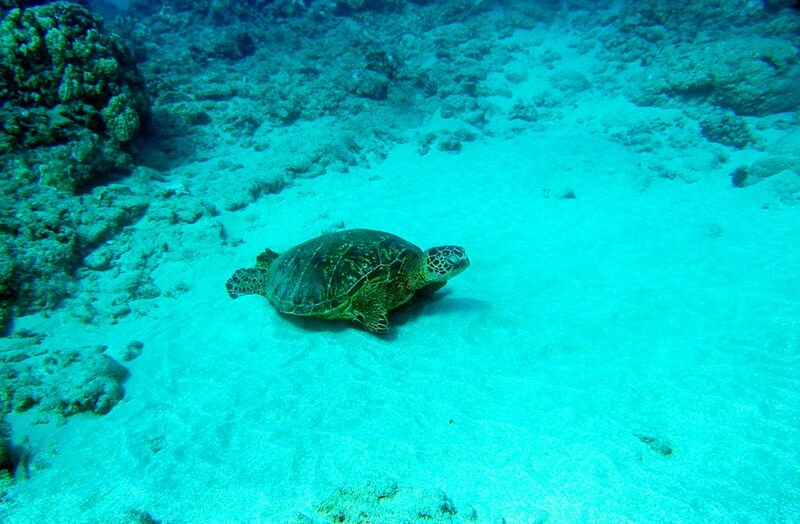 A green turtle for example, can deliver a powerful bite but it will not bother you if left undisturbed, remember that you are an spectator and behave as such. As you get closer to the “edge” of the coral reef that protects the beach there may be strong currents or wave surges, there are plenty of Park Rangers, volunteers and lifeguards that know the bay and will be able to advise you regarding any area that you might want to explore. Do not hesitate to ask for information. That is why they are there in the first place. Most of the staff are either volunteers or have requested to be transferred to this location and are passionate about the Bay. 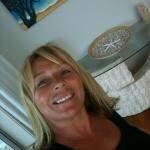 My husband and I have lived and worked in Hawaii for over 20 years. We recently decided to collaborate on a business that would allow us to both utilize our strengths and knowledge in business as well as our love for and knowledge of our chosen home. Sharing Hanauma Bay with Hawaii’s visitors has been a great enjoyment for us as we truly love, respect and enjoy the Bay ourselves and we get to provide others with the opportunity to enjoy and appreciate it as well. We provide instruction and information about the Bay to allow our guests the opportunity to experience for themselves the beauty of one of our most precious natural resources in a safe and responsible manner. We work directly with only a few hotels and leave the rest of our seats open for guests who have found us on the internet or through our printed advertisement. We have kept our business intentionally small so we can personally see to all of the details that go into providing excellent service for our customers. We personally insure that our equipment is cleaned and sanitized properly and in good working order. We provide extras like personal bottles of anti-fog for re-application and digital underwater cameras for rent. We keep our vehicles clean and mechanically sound. 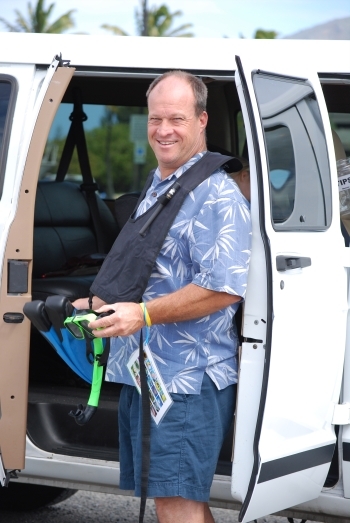 Our drivers are trained in transportation, customer service and beach safety. 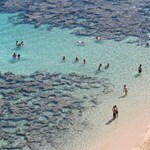 We operate as a taxi service (rather than a large tour bus) with the added bonus of providing equipment for snorkeling. Because of the smaller groups we are able to provide more personalized service and guarantee our customers a maximum of 4 stops(usually less) in Waikiki before heading to the Bay. Hanauma Bay itself has an 8-passenger per vehicle limit. By using only 8-passenger vehicles we show respect for the Bay as a nature preserve and do not overcrowd the park at any given time. We are also able to take our customers directly from Waikiki to Hanauma Bay without stops or transfers. We enjoy and appreciate the opportunity to share this beautiful natural resource with visitors to the islands and try always to emphasize that respect for the environment and safety are the keys to getting the most out of your Hanauma Bay experience. Choose the tour you are interested in, click the red “Book it” button adjacent to the tour information, and complete the booking form. You can also call us toll free at 1 (808) 291-7954. We are available to discuss your schedule and options during our normal business hours: 9:00am – 5:00pm Hawaii Standard Time. I am interested in booking the Hanauma Bay tour package with you but we were planning to spend some extra time there on our own. 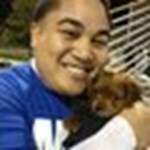 Is it possible to take the early trip from Waikiki and return at a later time? What we do for that scenario is that you can pay $5 directly to the driver and he/she will pick you up at a later time, depending on availability. Do you rent life jackets? We have a couple of flotation options, jackets or belts at no charge. What is a fish card? This is an identification card for several fish you may see on your visit to Hanauma Bay! 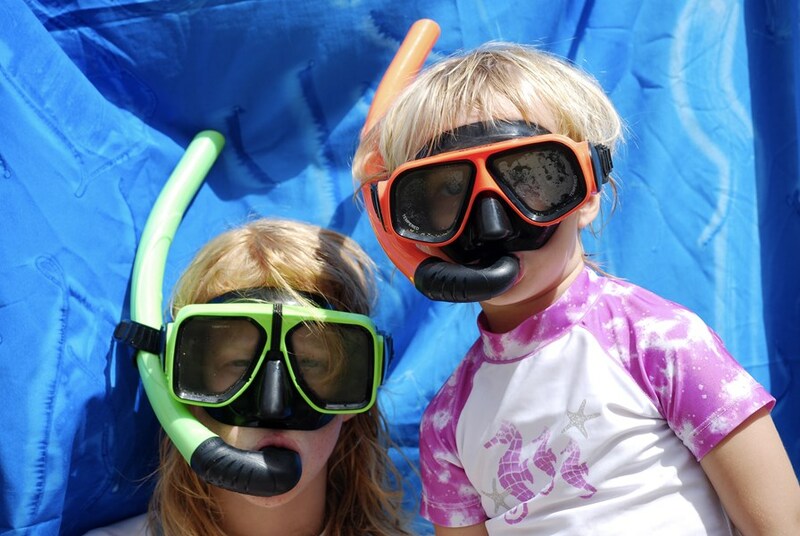 What's the youngest age someone can snorkel? Typically if they know how to swim and have used goggles before the youngest is 5. Otherwise most kids can do it by the time they're 6. If anyone in your party is not comfortable snorkelling they can still have fun hanging out at the beach with a boogie board. Great afternoon spent snorkeling in a great spot at a great price. 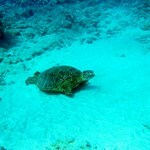 Saw a huge variety of fish including sea turtles, octopus, Morey eel's and more. This was made all better with a fantastic tour guide Isaac. He gave us valuable information for the rest of our trip whilst making the trip very enjoyable. Cheers. If you are looking to visit Hanauma to snorkel this is the way to do it, equipment is all provided which enables you to get straight to the activities without queueing after the compulsory video. Pick up is from Hotel in comfortable van with snorkel instruction given by driver on the way, this believe me is a hoot and is worth the $20 fee alone. Thank you Isaac!!!! we had the best day snorkeling!!! If you are visiting Hawaii and want to snorkel i recommend Snorkelfest with Isaac!! Arrived early, had everything ready, made us feel at home.... very friendly and so professional! 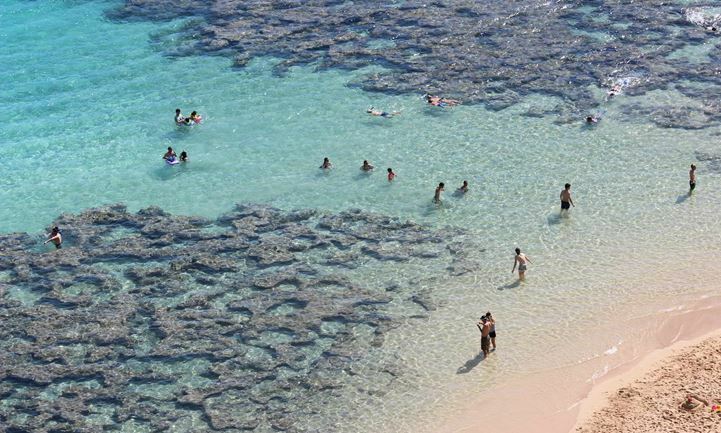 this is my 3rd visit back to Hawaii and we have tried many companies and Snorkelfest Rock! 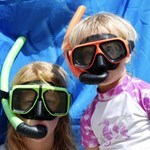 Thank you to Rachel & Cousin Isaac of Snorkelfest for a wonderful 1st time snorkel adveture. Thank you for being patient with our hawaiian time arrival, last minute gear rental craziness, & trying to work with our last minute extension request. Special thanks to Cousin Isaac for keeping us entertained on the ride to & from the bay. We'll request for you to take us lolos up the coco trail! Mahalo!!! Was a lot of fun to snorkel with this company. 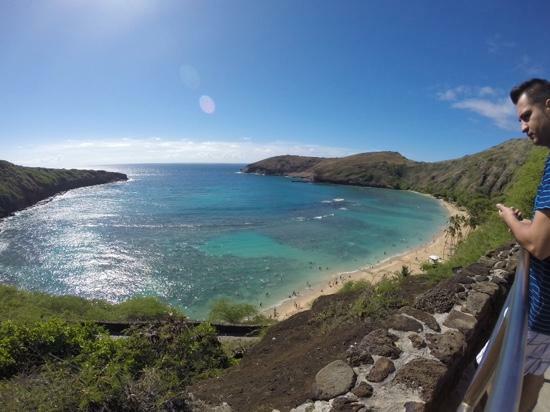 We took the Hanauma Bay Tour Package and it was great. The Equipment was decent and the driver was knowledgeable and friendly. The lines at Hanauma Bay are a bit crazy but once you get to the beach its amazing. Since we didn't rent a car while on Oahu, Snorkelfest delivered a solid experience for the wife and I. All 5 stars go out to cousin Isaac! the tour and rental cost a total of $22 plus tax but cousin Isaacs upbeat personality was worth much much more. Booking the ride online, I just expected someone to drive me and give me snorkel gear. Cousin Isaac gave us all the info we needed to know about the gear and reef. 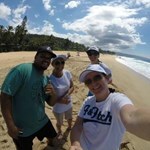 He was very knowledgable when it came to showing us around the island and most importantly, ... morehe made it fun!!! The whole van was alive and smiling throughout the whole ride. I'm definitely booking here next time I come back. Way to go Isaac!!! We booked two different trips with Snorkelfest as we were so impressed with the first, most especially the outstanding service from Isaac, our guide on both occasions. 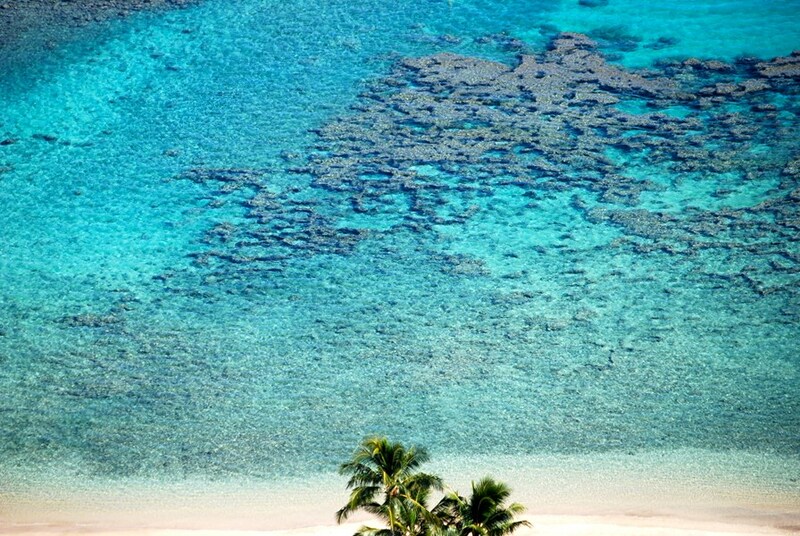 Initially booked a shuttle service and snorkel/fin rental hire for Hanauma Bay. Isaac was the a stand out on this trip. He wasn't just a driver, he taught us how to use the equipment, gave us safety advice, pointed out the best spots ... morewe should go to snorkel and giving us local hotspot and history facts along the way, couldn't have asked for more. 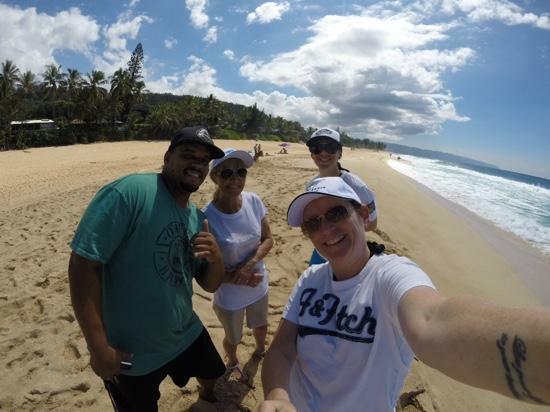 After our initial tour, being really impressed with Isaac and still knowing there was so much of Oahu we had yet to see, we decided to do a Circle Island Tour - a new area of expertise for Snorkelfest. As a family group of 9 wanting to travel together, a private tour on offer by Snorkelfest was just the answer and we special requested Isaac. The booking staff were very accommodating and helpful at short notice (not much more than 12 hours!) and Isaac even sacrificed his day off to take us around. Can't say enough wonderful things about the Circle Island Tour. What an awesome way to get a taste of all the things that Oahu has to offer. An absolute pro to having a private tour is that we were able to specify exactly which parts of the island we were most interested in spending longer time at as we went around, but we let local lad Isaac guide us a lot. His extensive knowledge of the island was abundantly clear as he showed us all the local spots and made sure we saw the very best of what Oahu had to offer. Would book again without hesitation when I return to Oahu, but even if I didn't, the time spent with Snorkelfest on this trip has well equipped me for self guided travel around the island. You're the best cousin Isaac (& Snorkelfest!). Great day snorkelling at Hanauma Bay, plenty to see and we had our 8 year old daughter with us so didn't go out that far as it was her first time snorkelling. I would however suggest going early as by the time we got there about midday it was very crowded and therefore the water was quite murky. Really impressed with Snorkelfest, amazing company. Huge thanks to Carl and Isaac for there service. Both ... morereally helpful and informative and we so enjoyed their banter on the drive there and back. We spent two weeks in Waikiki and I have to say these two guys were the best guides we experienced. The driver of this tour made it a lot of fun. Great personality. 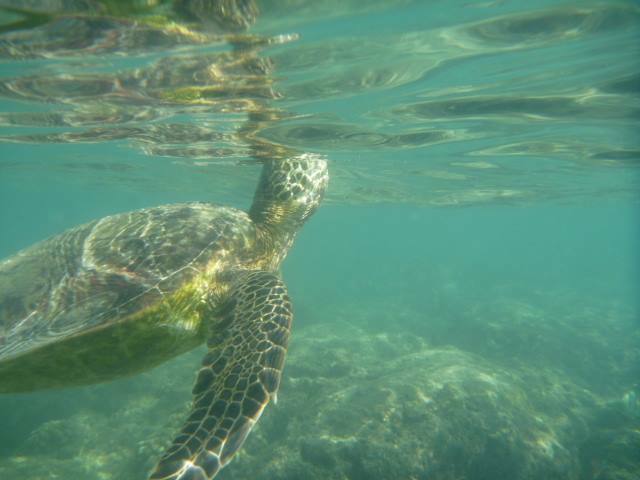 We have never snorkeled before and found this to be the perfect trip. Very good quality of snorkel and fins were included. Also used one of their cameras. Water was shallow enough that we felt comfortable going out farther. Good price. Did not take up our whole day. Have already recommended Snorkelfest to others. Felt very safe trying ... morethis for the first time. To be honest, the snorkeling at Hanauma Bay wasn't fantastic (I'd recommend going early before it gets too hot and crowded). But if you want an easy way to get there for a few hours this is a great trip. Isaac our driver was fantastic. Super friendly and informative and had all our gear organized and ready to go when so we didn't waste time at the bay getting sorted out. He also had great recommendations ... morefor other activities and places to eat which we found really helpful. Isaac picked us up and gave us the low down and pointed out all the good stuff on the way there and back. He was great very informative. The snorkeling was great fun too. Lots of fish to see and Isaac gave us a card with all the names of the fish. Would recommend to anyone looking for snorkel fun in Honalulu. Firstly, a huge shout out to Isaac our guide. 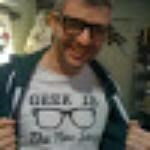 He was very organised, upbeat and entertaining and informative. For $20 ea but excluding the park fee it's an experience not to be missed. Hanauma bay is crowded with tourists snorkelling but is understandable with such an abundance of different sea life and beautiful scenery. 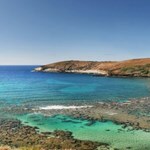 This is a very well priced ($20.00) per person snorkel trip to gorgeous Hanauma Bay Nature Preserve. Our guide, Isaac, was very knowledgable about snorkeling and gave us instructions on the basics of equipment and snorkeling on the drive. 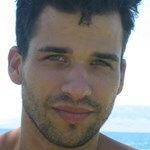 He pointed out great spots to visit and also suggested authentic island eateries. He was funny and personable and made the drive interesting. 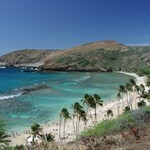 Hanauma Bay is not ... moretoo be missed - a pristine crescent shaped white sand bay. 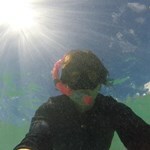 The reef in the bay is just loaded with colorful and exotic fish, easy to see for the most inexperienced snorkeler. Those more experienced can go out further into the reef. Highly recommend visiting this special spot. I've always heard so many good things about Hanauma Bay & wanted to go while I was on Oahu. They picked me up right at my hotel, told us all the best spots to go to on the way over. Spent just the right amount of time there and they picked us back on time to take us to our hotel. Thanks! I hired Snorkelfest because I had heard that the parking lot gets full and they don't let you in. They assured me they could drop me off anytime if I took this tour. 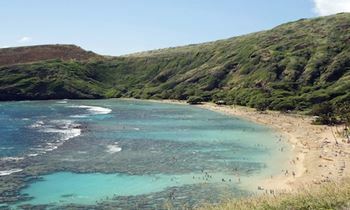 Hanauma Bay is an awesome place to snorkel! 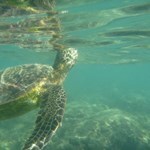 I saw big fish right in front of me, some turtles eating coral, and a bunch of colorful small fish. Thanks Carl! Snorkeling at Hanauma Bay was one of the most fun experiences I had while in Oahu. My boyfriend and I didn't have a car so we decided to book from Snorkelfest to get to the bay. I saw advertisements from all these tourist pamphlets all around Waikiki so decided to give them a call the day before I wanted to go snorkeling and was lucky enough to book at a time that worked for me. I'd prefer to use ... moretheir shuttle services than take the bus, which takes about 45 minutes from Waikiki. I had a lot planned for the day so didn't want to waste time on the bus. Our driver (I can't remember his name, but he was awesome!) was on time for our hotel pick up. He was very informative and talked to us about some hot spots we should visit and also gave us some tips on some prime snorkeling spots in the bay. He taught us how to use the snorkel gear, which was actually very clean! And they also provided us defogging solution which was actually very necessary. I believe from pick up to drop off time is about 3 hrs? It's the perfect amount of time to walk down to the bay, go through the video, and still have the chance to hang out on the beach and snorkel around the bay. I like how the snorkel gear they provided was the kind that stopped water from coming in through the snorkel tube so you don't swallow any water. Definitely helpful since I have a tendency to go in deeper than I should and than swallow a bunch of ocean water! Upon arrival at the Bay facility, the van parks a short walk from the park facility where the entrance fee is collected and visitors are required to view a brief video of the history of the park and its current approved use with guidance of dos and don'ts to protect its ecology. The underwater camera provided by Snorkelfest will let you keep digital image and video records of your experience - a worthwhile option if you do not have your own camera. The warm and buoyant waters of the southern exposure bay make it comfortable for the experienced, like our granddaughter or the novice like grandpa. In addition to the spectacular scenery and the marvel of the Bay's aquatic preserve, it is so surprising how fast the time flies by. Be sure to reserve a little time to just beach lounge and enjoy the tranquil scenery. For the less athletic, we would suggest the round-trip tram to descend and scale the path from the visitors center to the beach which is especially welcome after several hours of swim and snorkel activity. Isaac was our tour guide he made it so easy as well fun! We booked the early morning session which I would strongly recommend as the beach gets superbusy. Rachel went out of her way to book us at the earlier time and make sure we were picked up. I thank you both for a great experience! Best tour of our trip! When we were settled in the van, he gave us our equipment and quick directions how to use and adjust the equipment - then we were off. He pointed out things and provided some history of sights along the way. He told us where the best snorkeling would be, what to expec,t what to do and how to get where we needed to - great hand-holding all the way. Would we use the company again? Yes, definitely. Appreciated the hand holding - especially since our kids were first time snorkelers - think they felt more at ease with the information of what to do / expect too. 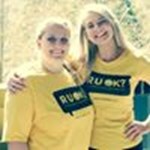 I had such a great experience from beginning to end! The driver was very helpful & informative and actually cared that we have an enjoyable time. 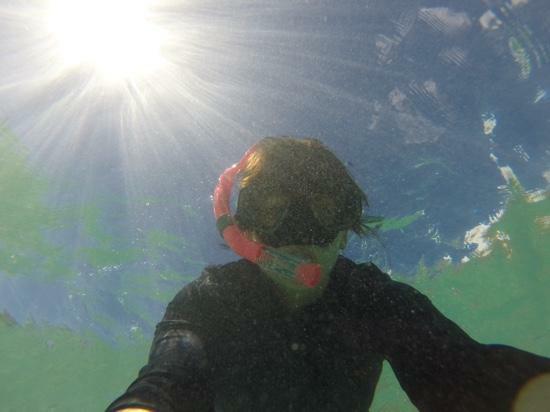 We got the package w/ the digital camera and was so happy because the water conditions were great! The bonus was spotting a little octopus along with ALL of the amazing fish! Too cool! We were having such a great time & didn't want to leave so I called Rachel ... more@ Snorkelfest & asked if we could stay longer.......it was not a problem & only cost a few dollars more, but was well worth the small expense! 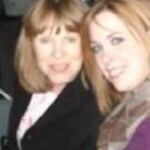 When we were ready to leave the van was right on time & the driver was just as helpful & courteous as when we arrived. A definite 5 star experience from beginning to end! Snorkelfest (Rachel and her husband, Carl) took care of me during my recent trip to Oahu. I needed a shuttle to go snorkeling at Hanauma Bay. 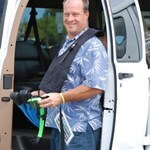 Carl picked me up in front my hotel, they provided equipment and fins and promptly picked us up afterwards. He even showed us how to use the equipment. There are varying shuttle pick up times from early morning to mid-afternoon. If you're visiting Oahu and don't ... morewant to deal with the traffic or driving around the island, then hit up Snorkelfest.